So here's the story explaining why "free" trade and globalization create so much wonderful prosperity for all of us: I find a nation with cheap labor and no environmental laws anxious to give me cheap land and tax credits, so I move my factory from my high-cost, highly regulated nation to the low-cost nation, and keep all the profits I reap from the move for myself. Yea for free trade, I'm now far wealthier than I was before. 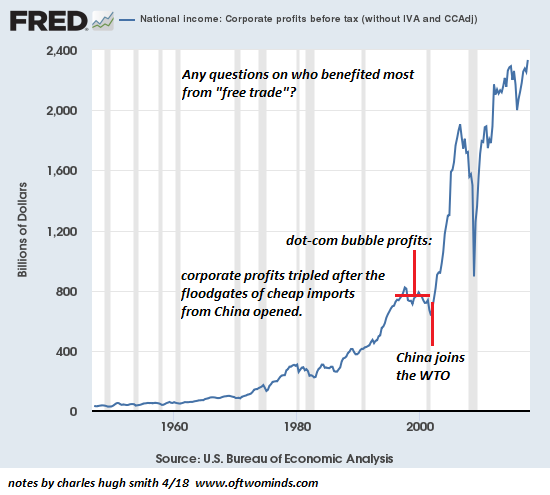 Imagine that--corporate profits skyrocketed once globalization / offshoring kicked into high gear. Explain that part about "makes us all prosperous" again, because there's no data to support that narrative. What's interesting about all this is the way that politicians are openly threatening voters with recession if they vote against globalization. In other words, whatever "prosperity" is still being distributed to the bottom 80% is now dependent on a predatory version of globalization. Let's rewind to the era of truly free trade, from the late Bronze Age up to the Roman Era. In the late Bronze Age (circa 1800 to 1200 B.C. ), vigorous trade tied together the ancient empires and states of the Mideast and the Mediterranean. In the Roman Era, trade in silk and other luxuries tied China, India, Africa, the Mideast and the Roman Mediterranean together in a vast trading network. Nowadays, trade and "prosperity" are dependent on currencies that are created out of thin air via borrowing or printing. The problem with gold, in the view of predatory globalization, is that it can't be printed or conjured out of thin air. That won't do, because predatory globalization's primary export is newly printed currencies: dollars, euros, yen and yuan. This puts every nation that can't print a global reserve currency at an extreme disadvantage. While the U.S. can conjure "money" out of thin air and trade it for goods, other nations must cough up resources and goods in exchange for the "money," and borrow it at hefty rates of interest if they want to use the global "money" for development or investment. Then there's a financial crisis of loan defaults and those who created and loaned out their global reserve currency demand the debtor nation sell all its assets and resources at bargain prices. Being a member of the European Union didn't save Greece from this fate; no peripheral nation can protect itself from the predatory powers who can create currency at zero cost and send the value higher by restricting its issuance after other nations have loaded up on loans denominated in the reserve currency. 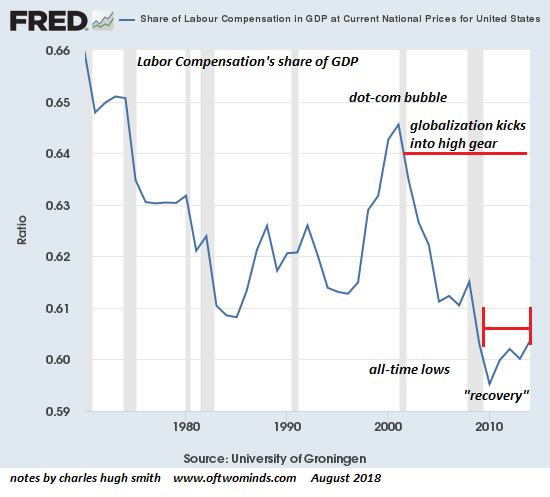 This is how "free" trade works in predatory globalization: The only thing that's free is the cost of issuing trillions in global reserve currency. Everything else will cost you dearly.